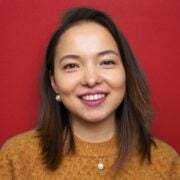 News Editor Pri joined ELN from Middlesex University with a post graduate degree in Advertising, PR and Media and oversees daily news gathering as well as interviewing and filming out and about. In fact, she’s taken the ELN cameras to Denmark, France, Norway, Russia and Switzerland, perhaps that travel bug comes from her roots back in Nepal. Her specialities are: writing, scripting, research, TV reporting and broadcast journalism.